Project obstacles and solutions: The Norfolk Southern railroad bridge over the Wabash River in Wabash, Indiana was supported by limestone piers that were originally constructed in 1890. In time, the piers were showing wear and needed to be repaired. L.C. Whitford submitted a plan to build a column jacket that would surround each limestone pier with steel reinforced concrete. These jackets would be poured down to the bedrock in the river. This all had to be done while the railroad remained operational. Building a concrete column to surround existing limestone is a challenge, but doing so in the middle of a river with an active rail line was especially so. The first item of business was to build a provisional road to the piers in the river. IMI Aggregates supplied 6,000 tons of rip rap topped with No. 53 stone which was placed over concrete pipe to create a causeway into the river. Forms were then built around each pier and water pumped out so concrete could be poured. Each pier was fitted with structural steel to tie the limestone and the jacket together. At the top of each pier, the rail lines were lifted to build forms for a cap. L.C. Whitford had just 20 hours to construct their forms for each pier cap before rail traffic started again. The project also included two retaining walls at the landing on each side of the bridge. IMI supplied 50 yards of concrete for each of the five piers. Construction was dependent upon the rise and fall of the river. 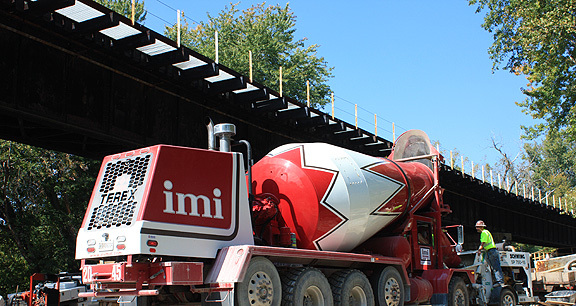 When water levels permitted pours, only one IMI concrete mixer was allowed on the construction site at a time. Timing was key to keeping the concrete flowing and the mix consistent from one truck to the next. The mix design was specific to the needs of the construction of the piers. The engineering specifications called for 28 day strengths to be at 5,000 psi. IMI consistently achieved 6,500 psi/28 days. The mix also had to take into consideration the large amount of rebar on each pier. Slumps were critical to the flow of concrete through the pump and to the bottom of the forms. So was the coarse aggregates in the mix. IMI QC/QA did extensive testing with L.C. Whitford's engineers to make sure concrete was workable and met specs.